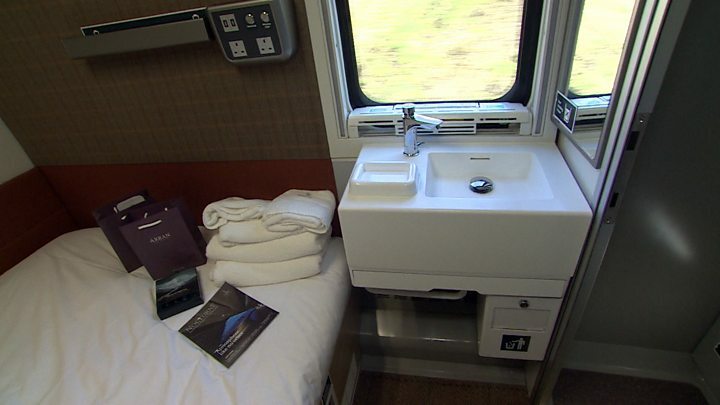 The new £150m fleet of Caledonian Sleeper trains has been unveiled - with travellers being promised an overnight stay in "a hotel on wheels". From June, 75 new carriages will offer en-suite double rooms for the first time. There will be 484 rooms available, initially on the Lowlander route between London and Glasgow/Edinburgh. They will be followed by a Highlander route between London and Aberdeen, Inverness and Fort William. The new trains hark back to an era of luxury overnight travel between Scotland and London. The Caledonian sleeper has been running in various forms since 1873 when specialised sleeping carriages were first introduced. For the wealthier travellers, that included luxurious compartments with seating areas and en-suite toilets. The service was almost scrapped when the railways were privatised in the 1990s, but were saved after a high-profile campaign. Despite using ageing stock, the trains remained popular. Rival road offerings were short-lived. Stagecoach launched a Glasgow/London overnight service with special sleeper coaches in 2011, and First's Greyhound night coaches with larger reclining seats began in 2010. Both have since stopped. The rail service is now operated by Serco on behalf of Transport Scotland. Its new carriages are bespoke and designed for Caledonian Sleeper from scratch. Serco's Ryan Flaherty said the fleet would provide "a truly magical experience that will transform travel between London and Scotland". He added: "Safety is absolutely paramount for us. But, beyond that, this is a hospitality experience. "People now are very much looking for a decent experience - whether it is in a restaurant, a shop or indeed travelling on a train - and we have gone after that market." Another first for the Sleeper is the introduction of new engineering technology to stop things going "bump" in night. In the past, passengers have complained of being woken by a shunt when two sections of the train coupled together at Carstairs , but the operators say the addition of 150 Dellner couplers will be a "dream" development for snoozing guests. Serco's Ryan Flaherty said: "On the current train the coaches have to 'kick' together to make the contact, but going forward it's 'kissing'. "It's much more gentle and will be imperceptible to the guests who are asleep." Unlike standard rail fares which are released three months in advance, sleeper tickets can be bought a year before travel. Prices for rooms have been increased for passengers on the new trains from 2 June. Classic rooms cost from £170 each way for two people travelling between London and Glasgow, Edinburgh or the Highlands. The same room starts at £140 for one passenger, but the option to share with a stranger is no longer available. In the old-style carriages, which are operating until the end of May, the cost of two one-way tickets in second class two-berth sleeper is £140 for to Edinburgh or Glasgow, or £160 to Inverness, Aberdeen, Fort William, Perth, Dundee, Aviemore. Prices are higher for the new Club rooms, and the new double en-suite rooms start at £400 for two passengers. Family rates will be available for passengers travelling with children, who can book interconnecting rooms from £170. The starting price for recliner seats remains at £45 per person for tickets between London and Inverness, Aberdeen, Fort William, Perth, Dundee, Aviemore.